BRIDGEPORT — David Kooris peers below Bridgeport’s railroad station. He points to the murky, green-brown water where the city’s harbor meets the mouth of the Pequonnock River. Even at low-ish tide, the water flows well underneath the tracks. But not as scary as other parts of the coastal rail trunk line, says Kooris, who is Bridgeport’s director of planning and economic development. In Bridgeport, he says, at least the tracks are elevated and designed to sit above the water. Some stretches of the line are at ground level in salt marshes and flood zones designated by the Federal Emergency Management Agency. When storm Sandy hit in October 2012, the tracks in Bridgeport stayed dry, but the storm surge still flowed out to the street — appropriately Water Street — leaving the train station an island with its entrances inaccessible and part of the embankment under the tracks washed away. It took about $400,000 to fix the damage and reinforce the repairs to try to keep the water from getting through again. Bridgeport Station sits on concrete pilings. The Pequonnock River flows underneath. During storm Sandy, the river water flowed all the way to the street on the other side of the station. And that belief leaves a nagging question. Is the weakest link in danger of becoming weaker as sea-level rise and extreme weather, induced by climate change, push water closer to the rail corridor, most of which already hugs Connecticut’s shoreline? The prospect has some worrying that the state plan to spend billions fixing long-standing safety and reliability problems and upgrading the line to encourage ridership will entrench the system in locations that may not be the best environmental choices. Others, while agreeing that climate change concerns should be taken seriously, feel the hazards it presents can be managed in ways other than moving the rail line — something overwhelmingly viewed as prohibitively expensive. “The issues that the governor and others hear about with the rail are interruption of service,” said Adam Whelchel, director of science for the Nature Conservancy’s Connecticut chapter who served on the state’s Two Storms Panel and prepared portions of the most recent National Climate Assessment. Whelchel has data behind his worry. Using the Nature Conservancy’s Coastal Resilience Tool, an interactive climate-change prediction and mapping system, he projected what would happen if the Hurricane of 1938 — essentially a Category 3 hurricane — were to occur today. More than 130 miles of rail and five stations would be inundated by flooding predicted to cover more than 44,000 acres. Throw in another couple of feet of sea-level rise, and the flooding rises to nearly 160 miles of track and one more station. The 1938 hurricane — known as the Long Island Express or the Great New England hurricane — killed hundreds and caused damage valued at several billion in current dollars. 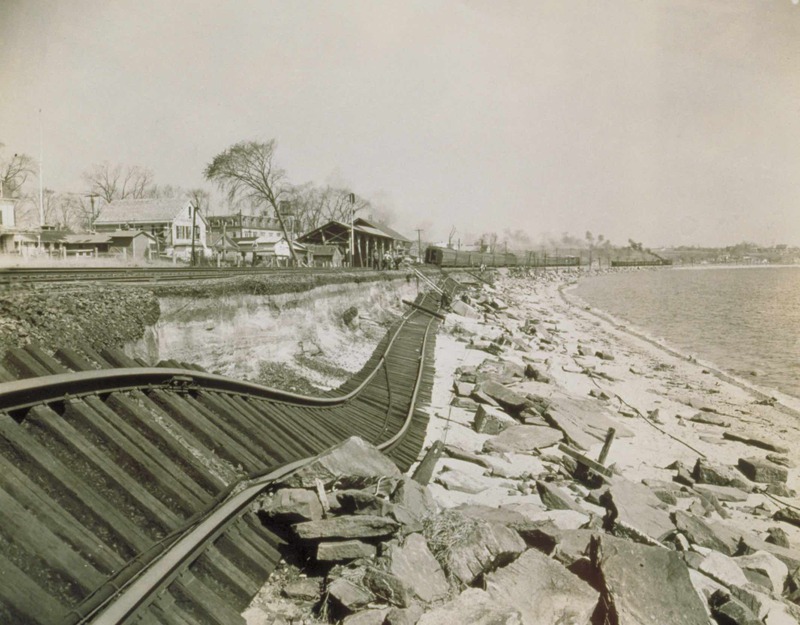 Iconic photos of the disaster show shoreline track in Connecticut twisted into the water in Stonington, Mystic and Niantic, not to mention a ship that came to rest alongside a freight train in New London. What troubles Whelchel and others is that the rail corridor today is pretty much where it was then, a location that goes back to the 1800s. It’s now surrounded by denser development, including I-95 on the land side, and higher water levels in Long Island Sound, presumed to be caused by climate change. Even so, until very recently, a number of climate change risk reports — including the National Climate Assessment, the Army Corps of Engineers’ North Atlantic Coast Comprehensive Study: Resilient Adaptation to Increasing Risk, and even the Federal Railroad Administration’s Northeast Corridor Future preliminary report — at best only mentioned the impact of climate change on the rail corridor in passing, with no specifics. Kirshen and others worry that, with increasing pressure to upgrade rail safety, forge ahead with high-speed trains, and add and upgrade stations, climate vulnerabilities may be considered less important. The main rail line in Connecticut runs from the New York to the Rhode Island borders. But it’s really two systems. From New York to New Haven, the 46.8-mile corridor is owned by Connecticut and operated for the state by Metro-North, a rail component of the Metropolitan Transportation Authority. It is part of Metro-North’s New Haven line, which in 2014 carried more than 39.6 million passengers. Amtrak, the quasi-public national passenger rail system, also uses the lines for its Northeast Corridor service between Washington and Boston. The 68.4-mile corridor from New Haven to the Rhode Island border is owned by Amtrak, which, besides its own service, operates the Connecticut-owned Shoreline East commuter service from New Haven to New London. Shoreline East handled nearly 660,000 riders last year. The state owns the rail platforms and most of the stations. Financing for new stations, station upgrades and any other capital improvements generally comes from a mixture of state, federal and rail operator funding. In recent years more than $1 billion has been spent on new rail cars. Hundreds of millions have been spent to upgrade the catenaries — the overhead electrical system that powers the trains. The catenaries are now fitted with an auto-tensioning system that makes them more climate-resilient. Extensive heat, associated with climate change, should no longer cause them to sag, and extreme cold should no longer cause them to snap. Nearly $100 million went to station upgrades and new stations, such as Fairfield Metro and West Haven. More money is needed for a large second station in Bridgeport, known as Barnum Station, and one in Orange. Another is under study for Shoreline East. Hundreds of millions are being spent to upgrade a moveable bridge in Norwalk that is more than 115 years old, and hundreds of millions more probably will be spent to upgrade other nearly-as-old moveable bridges. One of the biggest projects is the multi-year $1.2 billion upgrade of the New Haven Rail Yard. These projects are likely to ensure that most of the rail line and its stations stay exactly where they are for decades. In the case of the New Haven yard, that means it will remain on 74 acres adjacent to Long Wharf — nearly every square inch of which is in a flood zone that historically has flooded regularly. The New Haven Rail Yard has existed since the mid 1800s, at first sitting right on the shore. Since the mid-1900s, it has expanded to include land created with fill from the excavation for I-95. The water comes in from two directions: from the Sound at the yard’s west end and from inland runoff under the Water Street Bridge in an area known as the east cut. It is the lowest part of the yard — three feet above sea level. The East Cut, under the Water St. Bridge in the background, is the area of the New Haven Rail Yard most prone to flooding. There is now a pump station there to help alleviate that. The east cut pump station, which pumps water out of the rail yard, was built about 10 years ago, but Metro-North officials said water still gets in and runs over the tracks, even in situations like a storm during a full moon. So during Sandy all those expensive new rail cars were stored at Grand Central Terminal and at higher elevations along the New Haven line and at the yard in Bridgeport, just in case the New Haven yard flooded. And indeed water came in at both ends, though not to the extent it had previously. However, Nature Conservancy mapping shows the flooding potential worsening as factors related to climate change accelerate. The tracks themselves can’t be elevated, but other flooding and climate-adaptation alterations have been made in the yard upgrade. In an area that often flooded, a new electric substation was built higher off the ground, as were maintenance shops. The roadbeds for motor vehicles were raised slightly and additional drainage was installed. For Metro-North generally, sustainability efforts began after August 2007, when a severe rainstorm flooded the New York City subway. Dutta said the MTA has begun using a more stringent design standard that requires new structures and substantial upgrades to observe FEMA’s 100-year storm elevations plus four feet — two to account for sea-level rise and two as an extra safety measure known as freeboard. 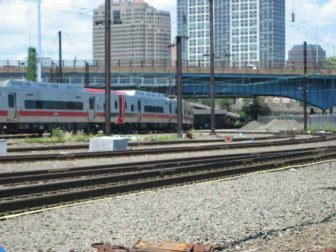 But even though Metro-North runs the New Haven yard, it neither owns it nor makes sole decisions on construction in it — though Metro-North officials are consulted. Metro-North’s design standard was news to DOT’s Bernick, who wondered if it could always be used, given the extreme difficulty and expense of elevating railroad track, which requires long runs of track for every foot of rise, among many other engineering alterations. Both men sounded variations on the theme that there are multiple ways to handle the kinds of storms and flooding anticipated from climate change. “What are you going do when New Haven goes underwater?” he asked rhetorically, asserting that inland water coming down from rivers was a bigger problem and would flood parts of the city before it floods the yard. “Do you manage so there’s no risk? Well nobody does that because it’s too expensive. It’s how much risk are you willing to accept? And that’s the system now — an acceptable-risk standard predicated on how quickly you can recover. The MTA’s Dutta said flexibility is a key component of recovery, which can include suspending service. It can also include moving equipment such as trains, ground-level switches and all manner of electrical components that are especially susceptible to salt-water damage. “It’s also equally a response to kind of cleverly retreat in the face of a really huge hurricane and come back once the sun is out,” he said. As to the ultimate solution of moving the entire line: “You may as well try to boil the ocean,” Dutta said. Moving the tracks or rerouting some trains is not out of the realm of possibility for some – but is an especially sensitive issue for those who are mainly focused on the economic engine Metro-North provides to Fairfield County, and by extension, the entire state. The view from a Metro-North train shows some of the salt marsh that runs for miles along the rail corridor from the Saugatuck River nearly to Fairfield. The concern is that as sea levels rise water could inundate the track permanently. A preliminary report from the Federal Railroad Administration, which did not agree to an interview with the Mirror for this story, offered potential routes for Amtrak’s Northeast Corridor service in addition to the main line it uses now. Ideas for regional and high-speed service included rail lines substantially inland from the existing tracks or ones that use a tunnel under Long Island Sound, bypassing Fairfield County — a proposal that was not well-received by economic leaders there. Placement inland would primarily be done to find straight, flat areas to accommodate high-speed rail, unlike the existing curvy coastal route. 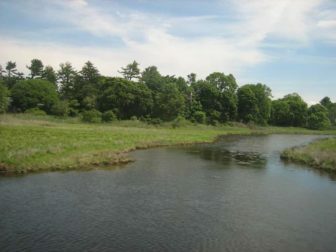 Inland routes also avoid areas like the huge swaths of salt marsh the tracks run through from north of the Saugatuck River in Westport nearly to Fairfield. Kooris said he thinks two simultaneous conversations are needed – one about coastal resiliency and climate adaptation and the other about how to improve the speed, efficiency and reach of the rail system, including better service to inner cities. “We are already seeing concerns about the reliability of the rail line call into question business locations further into Connecticut that are reliant on access to New York, and it’s very troubling,” he said. The Pequonnock River underneath Bridgeport Station, well below high tide. During Sandy the water eroded the bank and flowed to the street beyond the wall in the background. The wall has since been repaired with sheet piles and the bank stabilized. 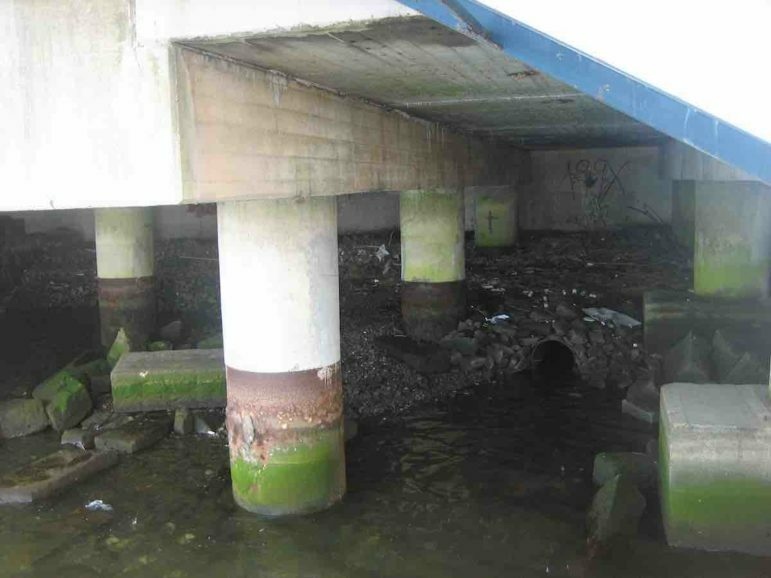 Kooris said Bridgeport is looking at water-based solutions, such as artificial reefs, to minimize climate impacts and to cut down erosion by higher sea levels on the footings for the current station area, which like New Haven’s, was built on fill. The site for the new Barnum Station was checked carefully to make sure it wasn’t in a flood zone. And it’s not — at least for now. But Rep. Jonathan Steinberg, D-Westport, a member of the legislature’s Transportation Committee and an outspoken environmentalist, said the economic imperative of an upgraded rail system in southwestern Connecticut needs to trump environmental considerations that could slow things down. “The lifeblood of the state from an economic standpoint is totally in jeopardy,” Steinberg said, adding he believes it will take billions of dollars just to maintain the status quo. “And that’s just to keep us going — the chicken wire and bubble gum route just to keep the thing going. 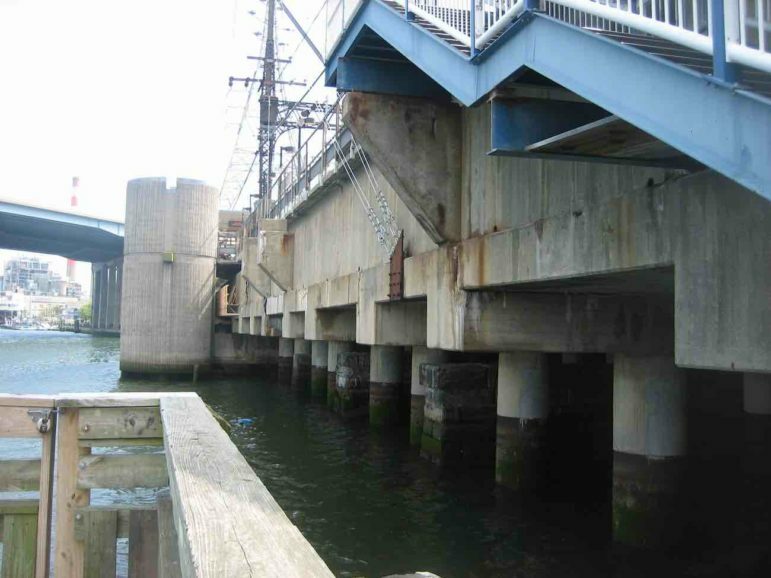 Yaro is a fan of solutions like the surge barriers favored by the Dutch and the hurricane barriers in Stamford, but in the context of a broad plan. McGee said the first task for the business community is to do a risk analysis of the rail line, which he says has never been done, and then figure out what to do. He said he’s looked at the FEMA flood maps and the various future climate scenarios. “There’s a huge problem,” he said. “I think we’re just in the early stages of understanding the impact of climate change, and there is a tendency not to see this as a systemic change. And that means a change to our land-use policies, our building codes and how we invest in infrastructure. And it’s a massive shift, and it’s going to be a generation-long shift in how we conduct business,” McGee said.